Disney World in Orlando, Florida has so much to offer, aside from the obvious theme parks we all know and love. 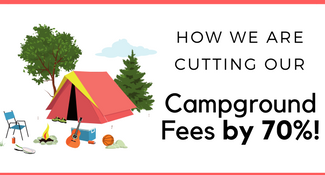 They are known for doing everything to excellence and sometimes it can, of course, be costly to do some of the things they offer, but they are also very good about giving more affordable options for many things as well. 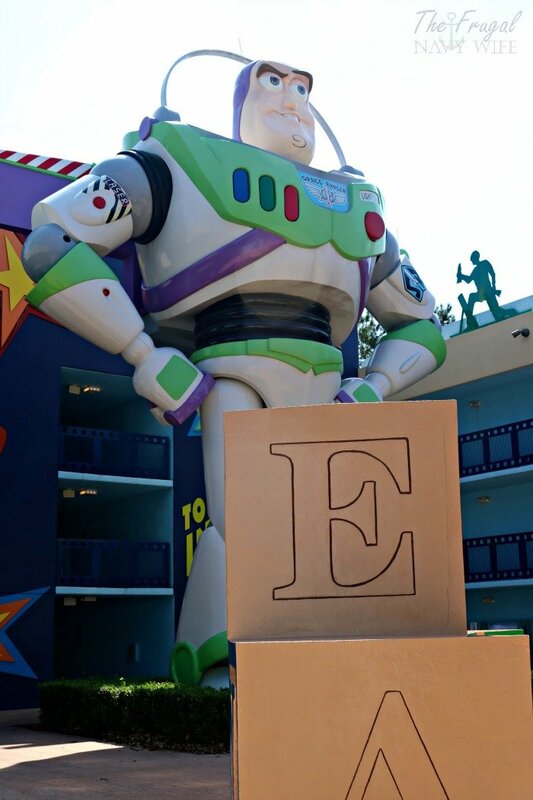 The Disney all-star movie resort is no exception. They have several economy resorts that they call the “All-Star” resorts, as well as a few others. The All-Star ones are all together in one location and are just minutes from the parks. There are times throughout the year where the rooms are discounted during the off-peak seasons and you can stay for no more than you spend at another nearby hotel. 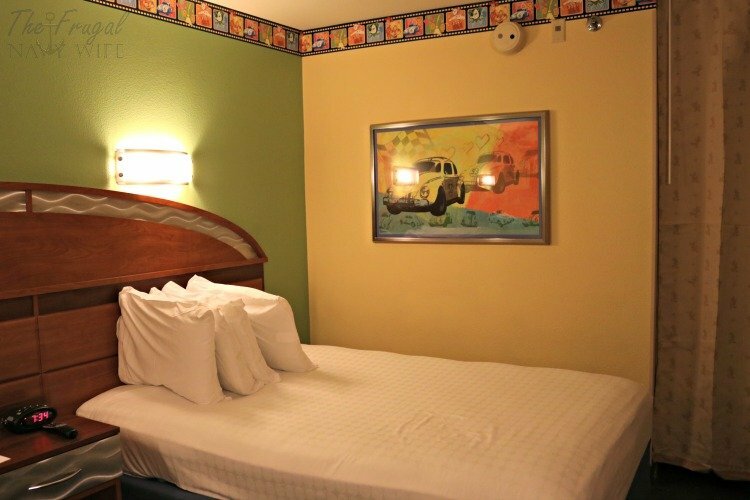 My family and I stayed at the Disney All-Star Movie Resort in September, which is a perfect time of the year, for avoiding the crowds, and we got a good deal on the room. Overall, we would’ve loved to have stayed another night or two to take full advantage of everything there is at the resort, and we will definitely go back. 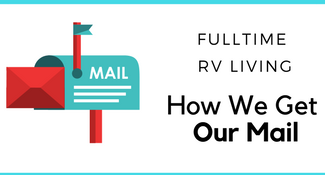 Let me give you some details on what is there, and what to expect so that when you are planning your visit, you can know ahead of time if this is the right place for your family to stay. 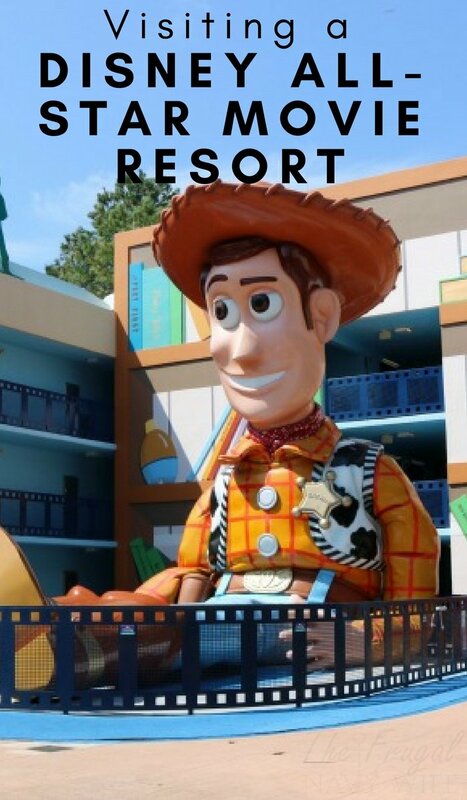 One of the first things to know is that these resorts all have a similar set up to them – there are different sections of the resort that are divided by a theme – think theme park parking lot, i.e…goofy row 22. This one has 5 movies that it is divided into – Toy Story, Fantasia, Love Bug, Mighty Ducks, and 101 Dalmatians. The buildings are the same for the most part, and the rooms very similar, but each with coordinating décor. There is always the main one that is a bit larger and central to the larger pool and the resort lobby area, and in this one it is Fantasia. If you prefer to be closer to the lobby and save as much walking and driving, request to stay in that section. There is another pool in the Mighty Ducks area also, though, so if you are closer to that for your room, you may prefer to just go to that one. It will likely have a smaller crowd at it, too. 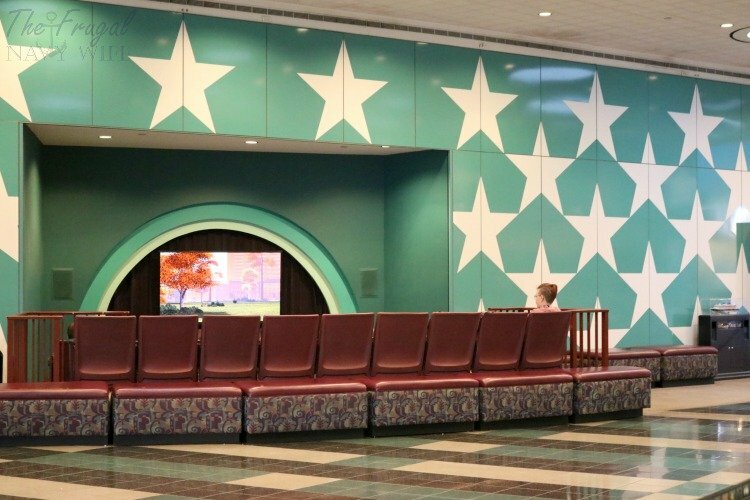 When you arrive at the Disney All-Star Movie Resort to check in, there are two parking areas – one is right at the front and is more of a pull-up area that is smaller, but you can unload your luggage first and then go move your car if you prefer not to do so. Then there is also a check in lot to park in. The resort grounds are arranged in a large circle so depending on which section you are staying in, you just move your car after checking into that area and can unload from there just as easily. The lobby is spacious and they have it all decked out like a movie premiere, with balloons, and even an area where you can sit and watch whatever movie is on at the time. My kids stayed there watching the Incredibles while I checked in. There is an area to take photos on the red carpet too, for fun, and also a caricature artist there that will draw your portraits if you like. Tip- If you are a pin trading family, they keep a few boards of pins for trading up at the Disney All-Star Movie Resort check-in desk – just ask and they will take them out and let you peruse them! Off the main lobby is a fun souvenir shop called Donald’s Double Feature, plus an arcade. 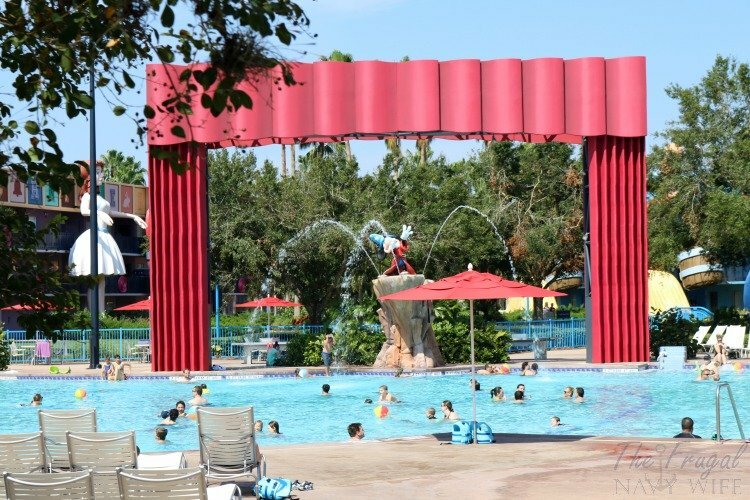 The food court is also right there as well and it leads out to the main pool in the Fantasia area too. 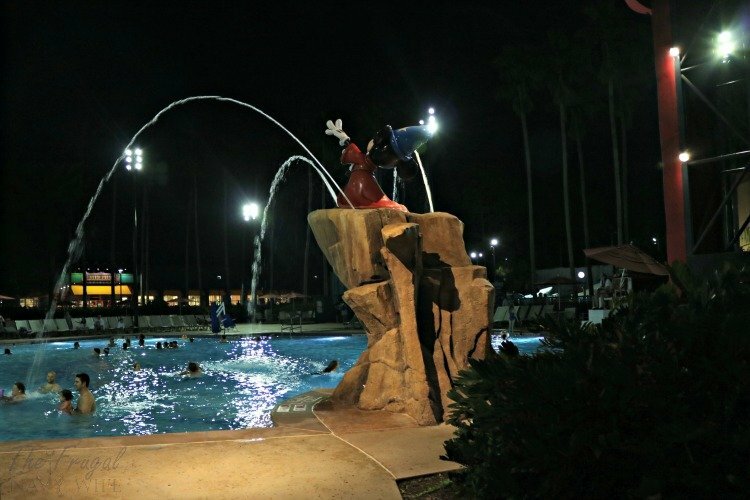 The Fantasia pool is of large size and has a cool Sorcerer Mickey in the center with water spouts. There is plenty of seating and the pool towels are there waiting for you. 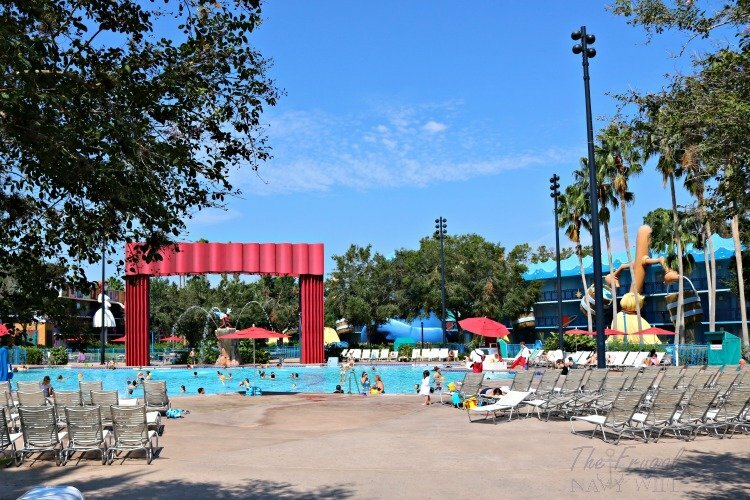 Out around the Fantasia pool and in that nearby area are a couple of other fun places you can check out: There is the Reel Spot theater which plays a different movie every night under the stars at 8 pm, the Silver Spirits Poolside bar, and a playground. 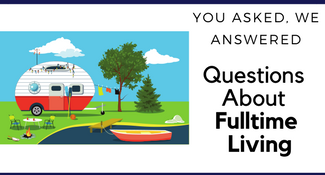 They offer some other fun activities too, but you will need to pay attention to the times if you want to do these because they are not all the time. They have a cookie decorating event, specialty cupcakes, a tie-dye event and relay races. Some of these do cost extra of course. They also have a running trail you can utilize that goes out a mile from the resort. As far as the rooms themselves, they are fairly standard and are not the fancy, more cushy type like the more expensive resorts, but for my family, they are just fine with us. 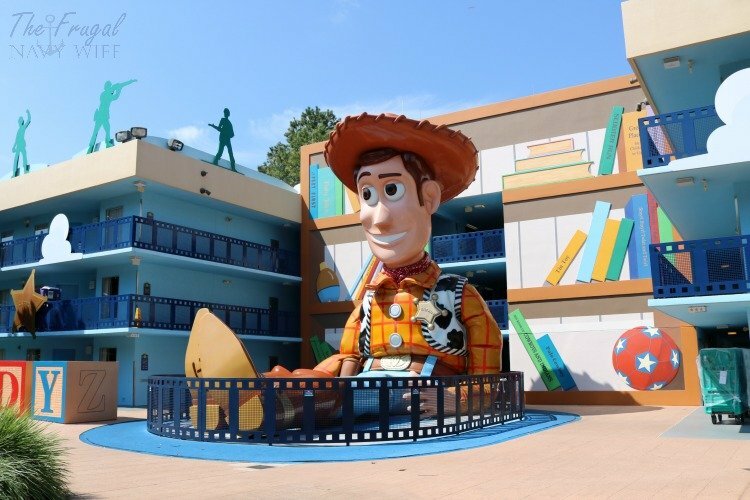 The beds are comfortable, they have lots of channels to watch, and always have classic Mickey Cartoons running as well as a bedtime reading you can use if your children are smaller. There is some storage space for clothing and the shower and bath area, although small in size, is nice quality and does the job just fine. I believe unless you prefer to stay in the hotel and hang out, that there is really not a big need for too much in the rooms. 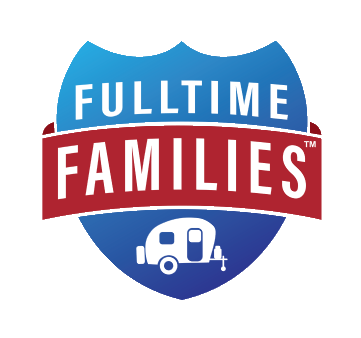 We are never in them much until late at night, so this works great for our needs. 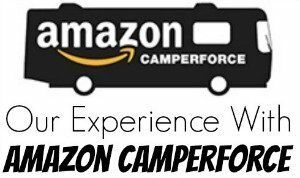 They give you a couple of soaps and some nice quality shampoo and body wash, but I will say to ask for extra because they give you one of each, even with more people staying with you otherwise. Out in the center of each section, there is always a fun area with huge decorations to see and play on. We stayed in the Love Bug section and the Herbie car there is great. The Toy Story area is really cool and even if you don’t stay there, it is worth walking over to check out. Fantasia has a huge Mickey sorcerer’s hat and giant brooms, which are very cool. The food court is very well done and has different stations with various types of food. One is breakfast foods, one pizza, etc. There are lots of options and if you have food allergy issues, they are fantastic about helping cater to you. They send the chef out to you and make you custom foods if necessary. 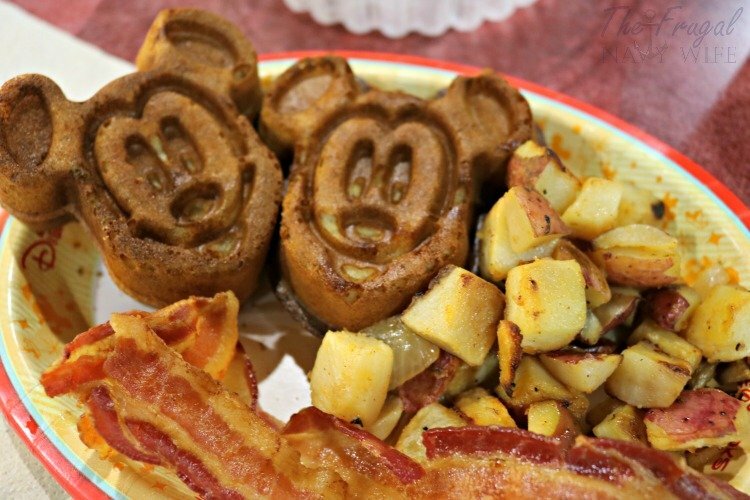 For me, I got gluten-free Mickey waffles made and I was in heaven! There is also a small area designed for kids with a movie playing to help keep them occupied while you eat. One other thing to note is that they do provide transportation to the parks and nearby areas, so if it is easier for you to leave your car there and take the Disney bus to the park, you just get on it right outside the main lobby and it runs very frequently. This saves you paying for parking at the parks. So I hope this has been helpful in giving enough information to help you make decisions for your stay and we hope to make it back there soon ourselves. 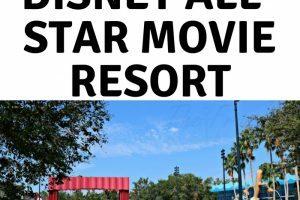 Have you stayed at the Disney All-Star Movie Resort? Let me know what you thought in the comments below!